Last week, I wrote all about the best free things to do on Oahu. And when I went to the Big Island a few months ago, I was on a tight budget. So, I was interested in finding the best free things to do on the Big Island. During the process, I learned that there are a lot of amazing free things to do on the Big Island. Some of these are things you can drive right up to, others require a bit more adventure. I thought I would share with you today the best things I found and let you choose which you want to do when you visit. Lava flow is unpredictable, but sometimes you can see lava on the Big Island from the Kalpana lava viewing area. I have an entire post written about how to see the lava flow, which you can read here. Although you can pay to take a boat or helicopter tour, or about $10 to rent bikes, you can also hike to the lava flow for free if you are on a budget or just prefer hiking. To get there, you will have to walk 4 miles each way on a gravel road. There are portable bathrooms at the beginning of the trail and about halfway through. There are small hills, but they are not too bad. Once you get there, you can walk around on lava rock before finding your spot to watch the lava flow. It’s best to hike out in the late afternoon so that you can watch the sunset. 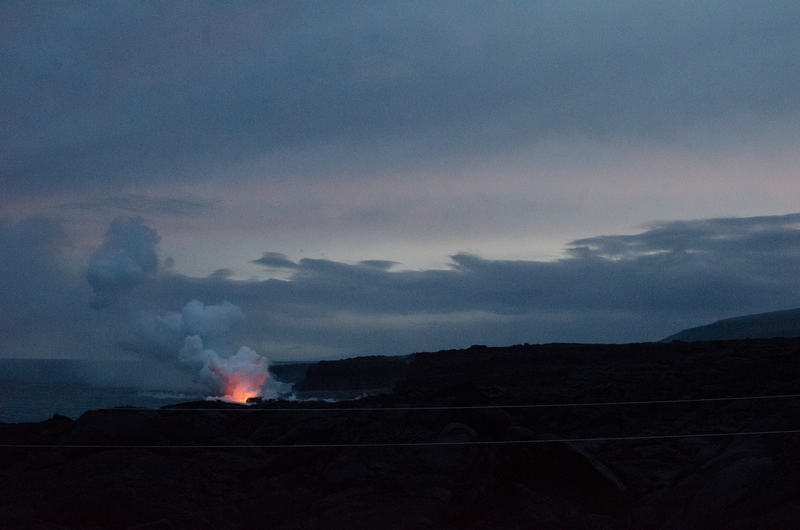 As the sky darkens, the lava glow turns from white smoke to pink to deep red. Bring plenty of water, food, and a flashlight if you plan to walk back after the suns sets because there are no lights illuminating the trail. Wear long pants, sunscreen, and good sturdy hiking boots, too. If the lava is flowing during your trip to the Big Island, this once-in-a-lifetime experience cannot be missed! The Pana’ewa Rainforest Zoo and Gardens is home to over 80 animal species, including Tzatziki, a two-year-old male White tiger, spider monkeys, lemurs, and nene geese (the Hawaii state bird). The zoo is also a botanical garden, so look out for orchids, bamboos, palms, and even a water garden as you walk around. At only twelve square miles, you can see everything in the Pana’ewa Rainforest Zoo and Gardens pretty quickly, but it’s sure to be a visit that you won’t forget. Since it is the only tropical zoo in the United States, be sure to take advantage of this rare – and free – experience. On Saturdays, a petting zoo for kids is open (call them for specific times). The zoo runs on donations, so if you enjoy your visit, consider leaving a small donation. Located in Hilo, Rainbow is 80 feet tall and almost 100 ft in diameter. The viewing area is only steps from the parking lot, making this an accessible, quick stop. No hiking is required. Rainbow Falls gets its name because if you go there on sunny mornings around 10:00 am, you might see a rainbow through the mist thrown up by the waterfall. The stunning waterfall is surrounded by lush greenery and drops into the crystal-clear blue water. To the left of the falls is a huge Banyan tree that you can walk over to. If it’s a rainy day, you won’t be able to see any rainbows. The waterfall is most crowded from 10:00 am to 1:00 pm. Rainbow Falls flows over a lava cave, which, according to legend, was the home of the Hawaiian goddess Hina. Time stands still here, and it is a testament to the power of lava that you don’t want to miss. Located in Pahoa, the Lava Tree State Monument is a forest of lava trees. These lava molds of tree trunks were formed when lava flowed through the area in 1790. There is a .7 mile loop trail that takes you through the lava trees. While short, it can be difficult because the parts of the path separated by uprooted trees. There are picnic tables, restrooms, and trash cans available to use, so bring a picnic lunch and enjoy this historic park. Black Sand Beaches are unlike any other, as they are made out of tiny fragments of lava. If you come to the Big Island, seeing a black sand beach is a “must-do.” How often do you get to walk on a beach made out of lava rock?! Punalum’u Black Sand Beach is perhaps the most famous black sand beach on the Big Island. Located on the southern part of the Big Island, it might be a bit out of your way to get to. But did you know that Hilo also has a number of black sand beaches? If you are in Hilo, look for Richardson Beach Park. If you look closely here, you will also see green crystals. This green sand is made out of olivine crystals. If it’s a green sand beach that you’re dreaming of, check out Papakolea Beach, located on the southern part of the island. Big Island Honey offers free admission to its museum and tasting room. You can try to find the queen laying eggs and watch the bees capping honey at their live, interior demonstration hive. You can also learn about the history of beekeeping and how honey is made. In the museum, beekeepers and staff are available to answer any questions you have. Big Island Honey also has a sampling station, where you can taste raw Hawaiian honey. Big Island Honey makes many different varieties of honey, made from the nectar of the Big Island’s different flowers. Try them all, and maybe bring some home with you. Although tasting and museum admission is free, tours are $10 and free for those under 18 years old. You’ve probably heard of Kona coffee, which is only grown on the slopes of Kona, Hawaii. There are many different Kona coffee farms, many of which offer free tours and coffee samples. Rooster Farms is a 100% organic, 100% Kona coffee farm that offers free tours and free coffee tasting. Because it is a small farm, tours are made by appointment only, so give them a call in advance to set up your tour. Hula Daddy Kona Coffee offers free coffee tasting, tours of the orchard and tours of the roasting room. Tours are offered as visitors arrive. Greenwell Farms offers free walking tours of coffee fields and the processing facilities continuously throughout the day. There are also free samples of various coffee products. Macadamia nuts are a top souvenir to bring back from your trip to Hawaii. If you want to try all different kinds of macadamia nuts, head over to the Hamakua Macadamia Nut Factory. Located near Kona, Hamakua Macadamia Nut Company only sells macadamia nuts grown by local farmers on the Big Island. At their Visitors Center, you can sample as many macadamia nuts as you like, and wash it down with free coffee samples. Here, you can observe the processing of macadamia nuts, too. If you are on the other side of the island, you might want to visit the Mauna Loa Macadamia Nut Corporation. To get to the factory, located in Keaau, about 15 minutes outside of Hilo, you will drive through three miles of scenic macadamia nut orchards. Once you get to the visitors center, you can enjoy free samples and see their nut and chocolate processing plant. The Mokupapapa Discovery Center is a small museum located in a century-old building in Hilo. Although you can see the entire museum in 30 minutes to an hour, it’s well-worth a quick stop to learn about marine life in Hawaii. The Mokupāpapa Discovery Center was established in 2003 to interpret the natural science, culture, and history of the Northwestern Hawaiian Islands and surrounding marine environment. It aims to raise public awareness of the region and ocean conservation issues. There is a 3,500-gallon saltwater aquarium, along with interactive educational exhibits, life-size models of wildlife found in the Northwestern Hawaiian Islands, and artwork. The beauty of the historic building that houses the Center is also noteworthy. There is a beautiful koa wood staircase and Hawaiian hardwood floors. While it would be easier to pay for a tour to the summit, you are allowed to drive your car to the Visitor’s Information Center. Depending on your desire and your budget, this might be a good option for you. Since you are not allowed to stargaze at the summit, you have to go back down to the Visitor’s Information Center anyway as soon as the sun sets. If you do drive yourself up, make sure to stop at the Visitors Information Center. Interpretive Guides and Maunakea Rangers are available and are happy to answer any questions that you have. Plus, telescopes are available to the public daily. During the day, a solar telescope is available for viewing the sun. Restrooms are open twenty-four hours per day. On Tuesday, Wednesday, Friday and Saturday evenings, weather permitting, you can also take part in their stargazing show, also for free. This show also includes the use of their telescopes. Paid tours are not allowed to participate, which could be another reason to go up on your own. If you drive up, be sure to be careful, as the elevation gain can cause altitude sickness. Before you go, make sure to contact them to find out about current weather conditions, as sometimes the road is closed. Want to learn more about The Big Island? Check out my recent posts, The Ultimate Guide to One Day in Hawaii Volcanoes National Park, Go Back In Time On The Pu‘u Loa Petroglyphs Trail, and Big Island Must Do: Visit The Hawaii Tropical Botanical Garden. And, don’t miss my step-by-step guide on How to See Lava on the Big Island.